At a time where many oil companies need to shed assets and spin off businesses to keep themselves alive, there are certain companies that are perfectly positioned for the current market. Oil prices have plummeted 70% from highs in June 2014 and not many upstream oil & gas operations are making money. Companies losing the least cash and maintaining the cleanest balance sheet can take advantage of the current market. The value of a large oil & gas company is partly in its ability to become the lowest cost producer and partly in its asset management ability. Some companies have diversified operations with upstream, midstream, and downstream operations and other large oil & gas producers have diversified basins with various types and qualities of oil, extraction methods, decline rates, days to production, access to global markets, and political risks. The way in which large oil & gas companies manage these assets can catapult a $1 billion company to a $100 billion company. 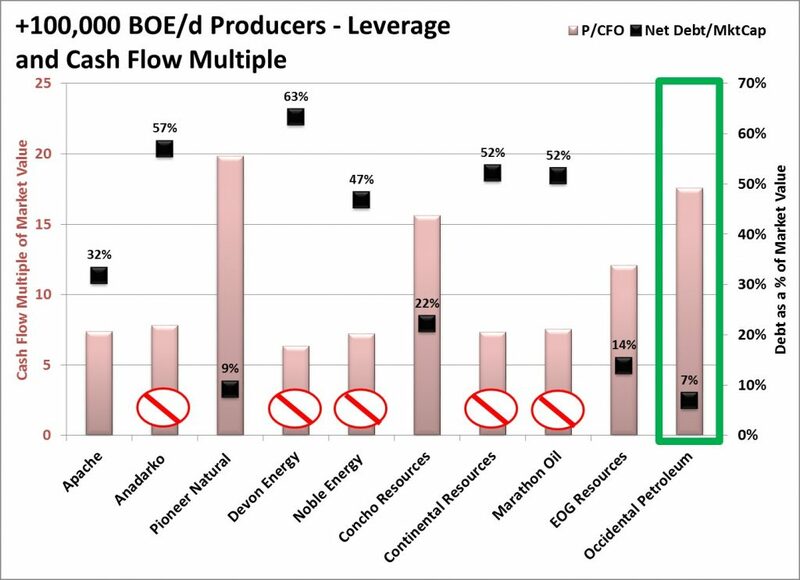 While 2014’s high oil price environment provided large oil & gas companies with the opportunity to spin off marginally profitable projects, the current low price environment serves an opposite purpose: acquisition. 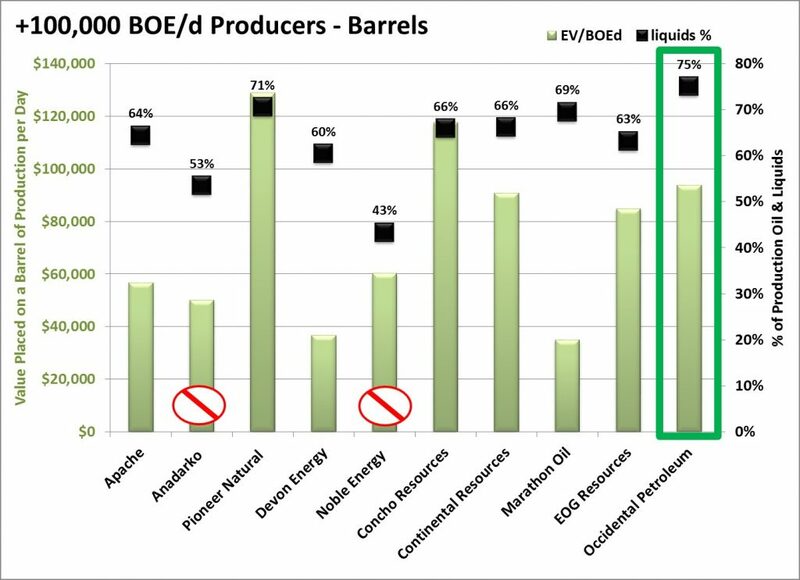 Why spend scarce capital on exploring oil & gas prospects when a company can acquire a rival producer’s production and proven reserves at relatively low values? If oil-rich countries are in a game of market share to countries like China & India, why aren’t independent oil companies in a game of market share within the regions of their segmented basins? If countries like Saudi Arabia, Qatar, Kuwait, and the UAE can survive low prices, what independent producers can survive equally as long? 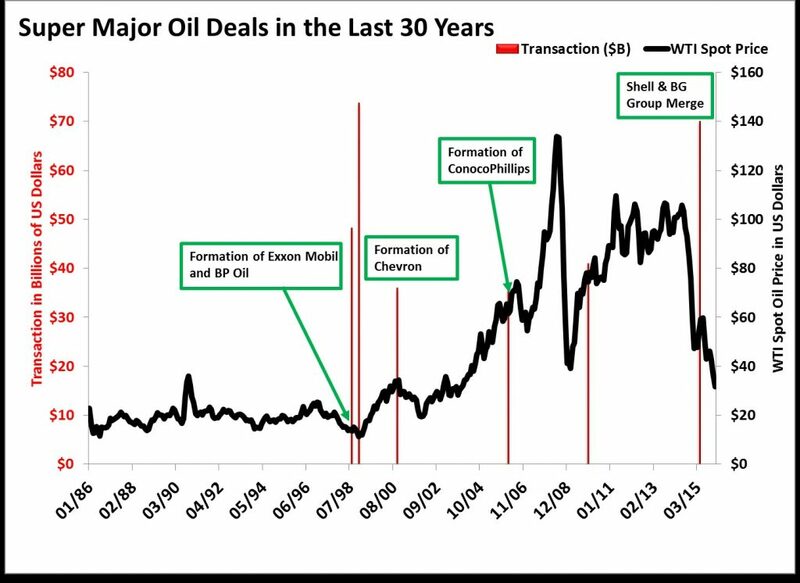 It is in our current market that giants like Exxon, BP, Chevron, ConocoPhillips, and Shell are formed. Another large oil & gas producer finds itself on the cusp of joining the ranks of oil & gas super-majors: Occidental Petroleum (OXY). 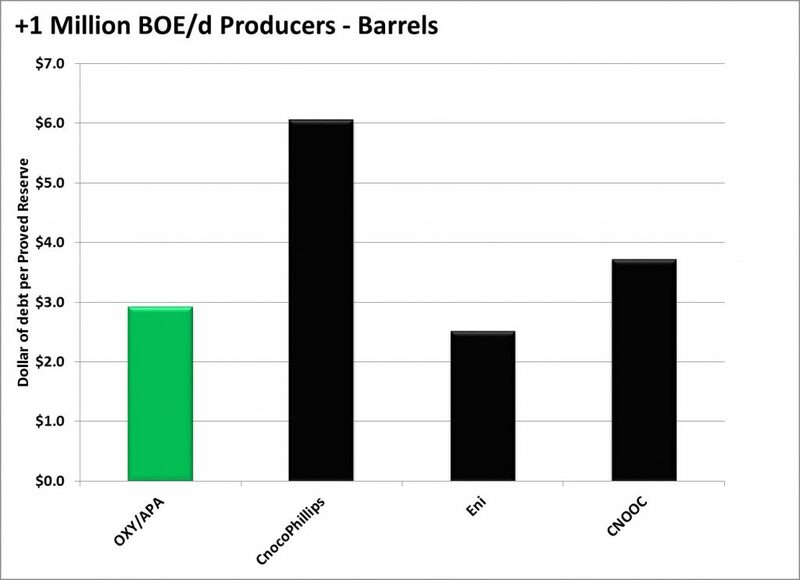 Occidental Petroleum is a US-based oil & gas company producing over 650,000 barrels of oil equivalent per day (boe/d). The company is unique; it has a dominant domestic position in the Permian Basin and holds other large producing assets in the Middle East and Latin America. In 2015, 67% of the company’s revenue came from oil & gas production and 33% came from its chemicals and midstream and marketing businesses. 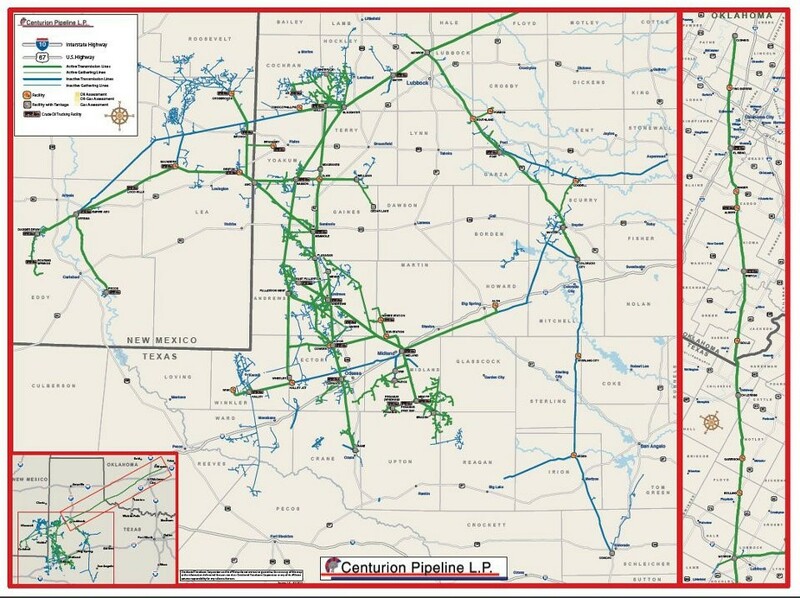 The company owns a large network of midstream gathering and transportation pipelines in the heart of the Permian Basin through its subsidiary Centurion Pipeline. Additionally, OXY owns a 24.5% stake in Dolphin Energy which processes gas and condensates from the world’s largest gas deposit offshore Qatar: the North Dome/South Pars deposit. The processing plant, in Ras Laffan, processes 2.3 billion cubic feet of natural gas and liquids per day (bcf/d) and transports gas to the UAE and Oman through a 3.2 bcf/d pipeline. This give OXY a stake rarely given in the largest natural gas deposit in the world. 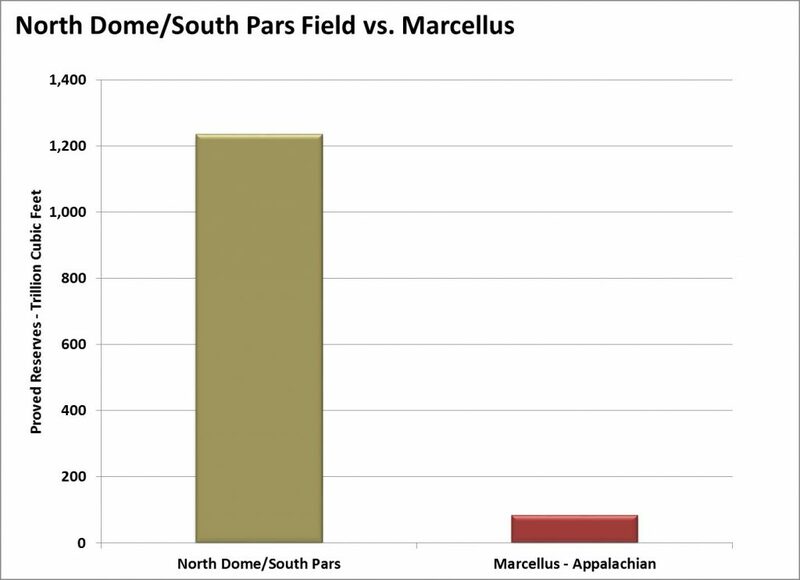 The field holds 1,235 trillion cubic feet of gas – or 15 times the size of the largest gas field in the US: the Marcellus. What puts OXY in the driver’s seat as it relates to potential acquisition is the fact that the $50 billion company has $3 billion in net debt. The company holds one of the cleanest balance sheets of major oil & gas producers. 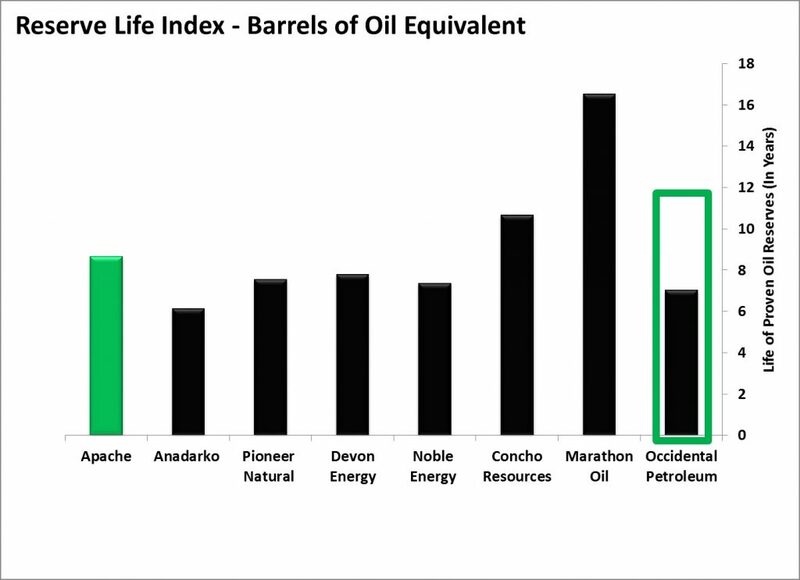 Unlike EOG Resources (EOG), Pioneer Natural (PXD), and Continental Resources (CLR), Occidental is not a pure shale play in the US. OXY has to continually manage a diversified set of assets and still managed to protect its downside by investing in its steadily cash producing chemicals and midstream businesses. Of its assets, Occidental prides its Columbia, Qatar, Oman, Permian EOR, and chemicals business as a resilient business that will generate free cash flow in the lowest of price environments. The Permian shale gives OXY quick production growth when prices improve and the company would like to continue the balance of long-lasting free cash flowing operations and US shale exposure. The finest execution of asset management in the oil & gas business has come at the hands of Occidental. As the price of oil fell to $75 in November 2014, OXY was already in the midst of shedding itself of unwanted assets. On 6 November, 2014 the company generated $1.15 billion from the sale of its 50% interest in the BridgeTex Pipeline to Plains All America. The pipeline is a 300,000 barrels per day crude oil pipeline from the Permian to the Gulf Coast. On 13 November, 2014 Occidental spun off its California assets into a separate company called California Resources (CRC). OXY spun off 80% of its position in CRC for $2.3 billion. Since then OXY sold its remaining stake in California Resources. California Resources now trades at a market value of $150 million, proving once again, OXY’s forward thinking and asset management expertise. Prior to these sales and spin offs, in early 2014, when prices were up over $100 per barrel, activist investors had pushed Occidental to sell their Middle Eastern assets. Those assets were estimated to fetch $8 billion upon acquisition by a consortium of state owned Qatar, Abu Dhabi (UAE), and Omani oil & gas entities. That consortium disintegrated during the disagreement between GCC countries regarding the Muslim Brotherhood’s role in Egypt’s “democratic” transition process in 2014. The UAE, Bahrain, and Saudi Arabia recalled ambassadors from Qatar because of Qatar’s support for the Muslim Brotherhood. In turn, in April 2014, Qatar dropped out of the consortium with Abu Dhabi and Oman to purchase Occidental’s Middle East and North Africa oil & gas assets. Like any good asset manager, OXY has split their Middle East businesses into those that make money and those that do not. Operations in Qatar, the UAE, and Oman add to the company’s free cash flow and thus are deemed core operations. Iraq, Libya, and Yemen drain free cash flow and as a result, OXY will sell Iraqi acreage back to the INOC (Iraqi National Oil Company) while letting their concessions expire in Libya and Yemen. Occidental has the ability and the incentive to catapult its production profile to those of super-majors. Scouring the major oil & gas producers with US shale and global operations we can narrow down Occidental’s options. 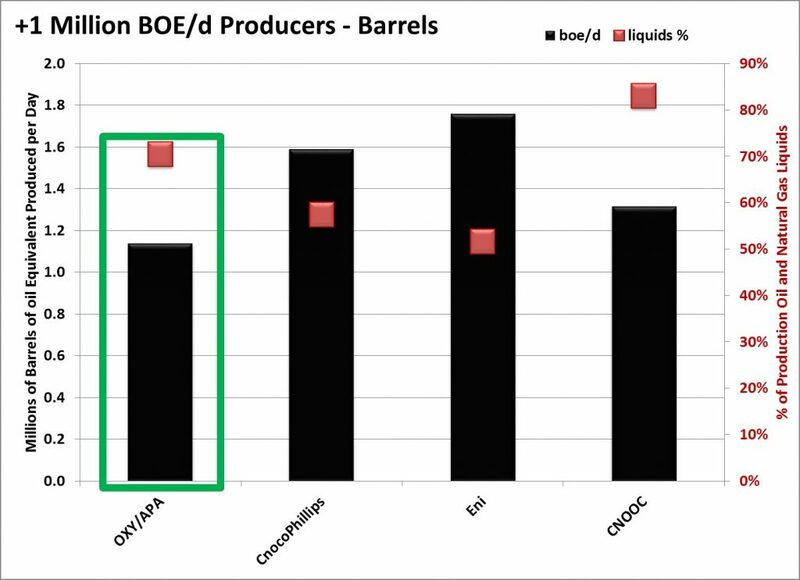 First, OXY will likely chose a company with a similar production profile in terms of liquids production. Second, OXY has not built a pristine balance sheet to go out and acquire a company with a heavy debt load. Third, OXY wants a balanced portfolio with a mix of higher growth US shale and lower declining conventional production outside US shale formations. 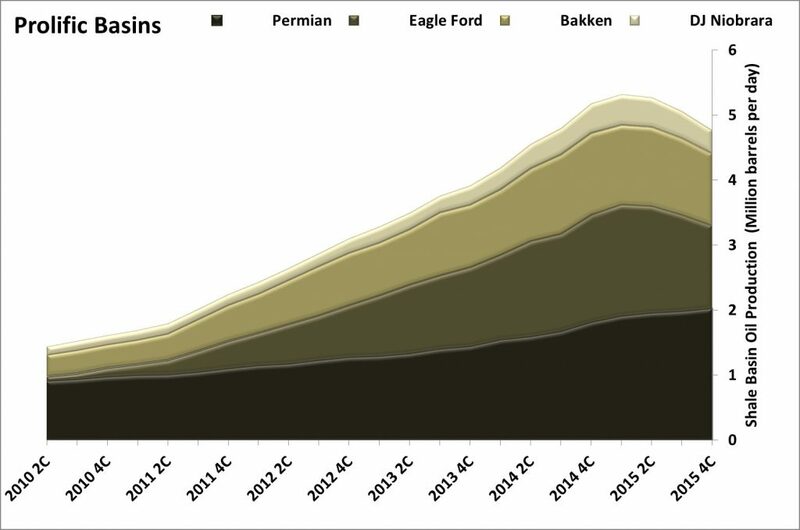 Occidental does not want to overexpose its production profile to the higher decline rates of US shale. This leaves Occidental with one option to dramatically increase its production and maintain the asset base and cash flows they desire to acquire. Based on the global companies and companies who have significant exposure to the Permian Basin, Apache Corporation (APA) stands out as the primary acquisition target. Of the Permian Basin players, Apache has a sizable reserve base when compared to its peers. Apache has been approached by an acquirer before; in November 2015, it was disclosed that Anadarko Petroleum (APC) was in preliminary talks to acquire Apache. As APA shares rose 35% to $50 per share, the offer was rejected and Anadarko withdrew its bid, claiming APA was now fairly valued. The rise in share price did not come from the takeover rumour. 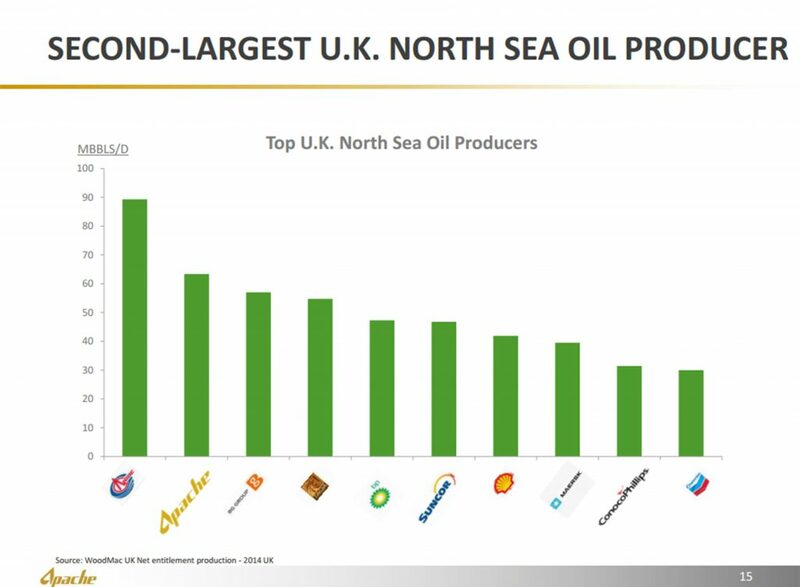 In reality, the results from Apache’s tier one offshore play in the North Sea were what pushed the share price. It wasn’t that Apache was fairly valued – but Anadarko could no longer afford to pay such a high premium with their own stock. The North Sea results are a game changer for the company and show the long term sustainability and growth potential of Apache’s core offshore asset. The predatory takeover from Anadarko was in fact to keep predators away from their own stock. It was rumoured that Chevron (CVX) and China Petroleum & Chemical Corp (SNP) were looking at Anadarko as a takeover target. If Anadarko had managed to pull off the Apache takeover, they would have made themselves less attractive to a takeover. With over 1.3 million barrels of oil equivalent production and operating in 12 countries, Anadarko would be too large and difficult to integrate into the super majors’ operations. As the Anadarko-Apache attempted acquisition was made public, business media and analysts tried to narrow down who could potentially acquire Apache. In a frenzy to come up with quick answers, analysts would simply look at the financials and put two companies together. Some assumed Exxon would target Apache simply because Exxon’s cash position; however, Exxon (XOM) had plenty of Permian Basin acreage and drilling inventory. Exxon was also still in the process of integrating its XTO Energy purchase of $40 billion in 2010. EOG Resources (EOG) was assumed to be a potential acquirer of Apache. I had contacted EOG regarding acquisitions in this market and they had indicated they were perfectly fine with their acreage and inventory. EOG mentioned if any acquisition were to arise it would be a land acquisition near existing operations and not a company acquisition. Finally, probably the only other credible suitor for Apache aside from Occidental, Chevron (CVX) was looked at as a potential acquirer of Apache. Taking a look at where Chevron operates it makes sense that the company would look at Apache. Chevron has North Sea assets and a 2 million acre position in the Permian Basin. In the North Sea Chevron is producing 32,000 barrels of oil and 88 million cubic feet of gas per day from 3 fields. In total, Chevron has an interest in 9 offshore fields in the UK North Sea. Additionally Chevron has the largest acreage position in the Permian Basin and produces 120,000 boe/d – ranking it as the 6th largest producer in the basin. Although the companies have some geographic overlap in terms of operations, Chevron still has sizable positions with a vast inventory and organic growth potential in the North Sea and Permian Basin. The minimum price of $62 is not to say that OXY will purchase Apache for $62, but that $62 will be the minimum bid that would lead to a merger. This would be an all-stock deal where Apache shareholders are given to opportunity to participate in the acquisition’s upside by owning the larger company’s stock: OXY. The acquisition would put Occidental and Apache shareholders in a league of their own and bring the company closer to super-major status. Occidental is not a struggling Anadarko looking to stave off an acquisition, but an efficiently run company looking to build up its reserves, production, operational leverage, and sizable position with a very clean balance sheet. Together Apache and Occidental can build a new era of super-majors built from US shale and expanded worldwide. They will dominate energy supply in Oman, Egypt, the UK, and Texas and continue to be leaders in their respective basins through innovation, experimentation, and exploration. Apache is the ultimate low-cost producer. The company has international operations that can break even at a $35 oil price and North American operations that can break even at a $45 oil price. The company has focused on spending the bare minimum to remain free cash flow neutral in 2016 under the current oil price environment. 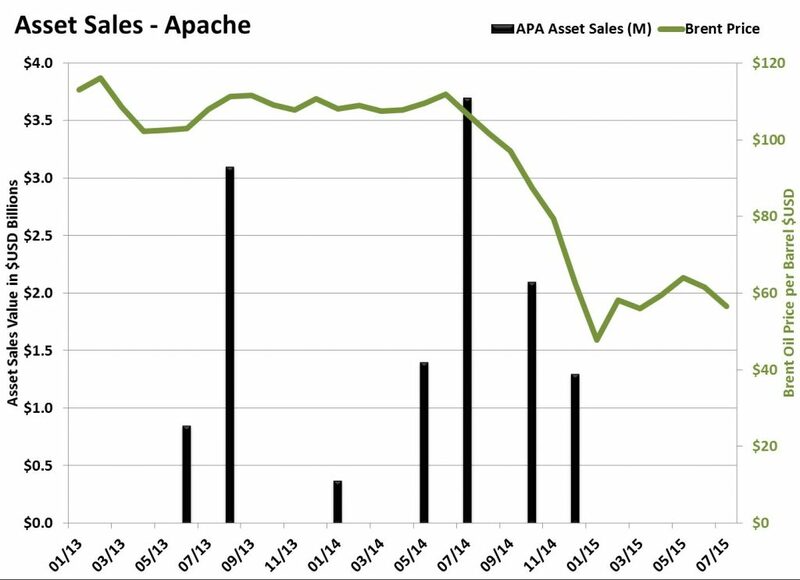 Apache had been a stagnant stock for years. While oil prices remained at an average price of $97 per barrel from October 2011 to June 2014 the company’s stock price remained flat. The company was operating in too many areas and had accumulated over $11 billion in debt. The focus for Apache was to sell its assets and pay down debt. 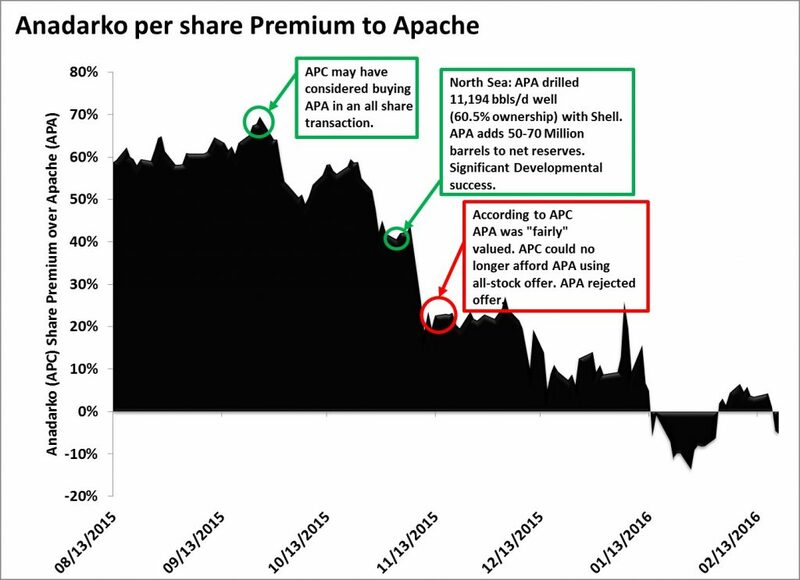 Apache made most of its sales in the height of the oil market and was accelerated into the end of 2014 by activist fund pressure from Jana Partners. Apache sold assets in Argentina, Egypt, Canada, Gulf of Mexico, the US Mid-Continent, and Australia. These assets sold for a total of $12.8 billion and were used to pay down debt to $7 billion and narrow the company’s operations down to 4 main geographic locations focused on upstream operations. Much like Occidental, Apache had been under pressure by activists to sell its remaining Middle East assets and reduce the company’s political risk in 2014. Apache knew the dominant position it had in Egypt as the largest oil producer with over 20% of Egypt’s oil production and the only company, at the time, with the right to independently market its oil in the global market. Apache fought back against Jana and it turned out to be the right move. 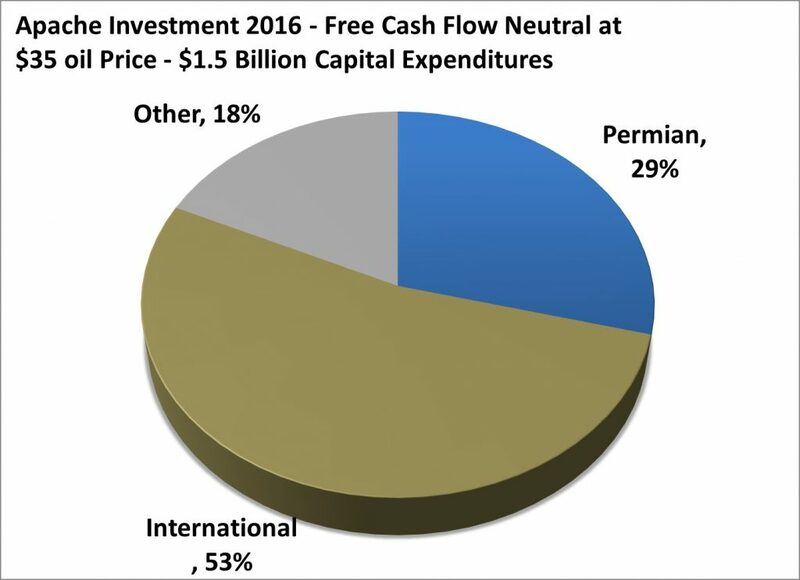 Like Occidental’s non-North American operations, Apache generates most of its free cash flow from Egypt and the UK. The majority of these operations are conventional and have stable cash flows with little upfront spending on infrastructure and avoid declining production from their fields, unlike US shale plays. 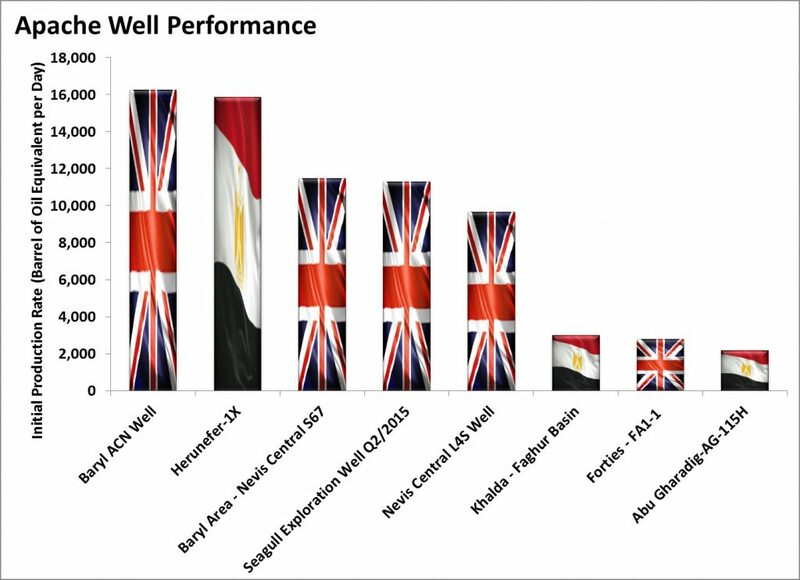 Most importantly, Apache’s international operations in Egypt and the North Sea remain profitable at $35 oil prices. Cost savings and reduced infrastructure spending drop Apache’s North Sea capex program to $600 million. In Egypt, Apache has a profit and cost sharing program with Egypt’s state-owned EGPC where the government shares in the costs of developing reserves. That cost sharing program saves Apache from bearing the full brunt of low oil prices in Egypt. Due to these cost cutting initiatives, Apache will be able to lower their overall international capex program, while still keeping production at current levels. This is a true testament to the intellectual prowess of the APA management team. 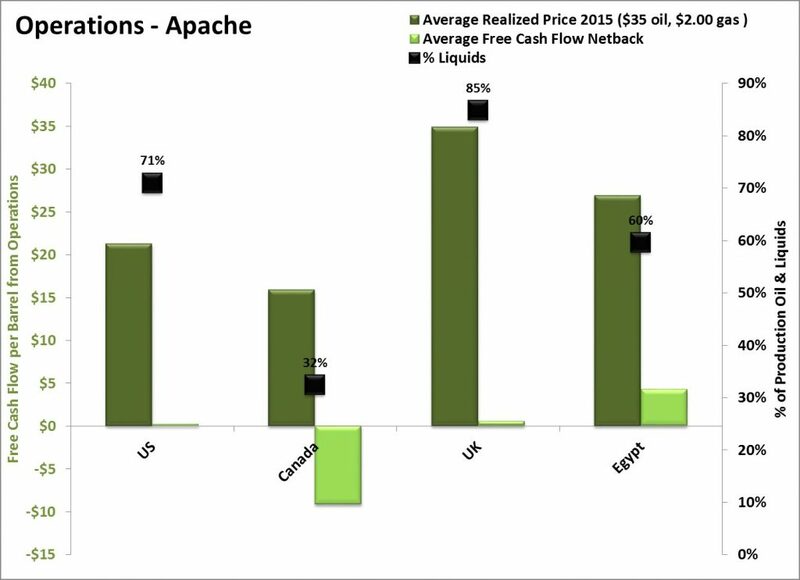 The well results below demonstrate why Apache is determined to keep spending money on international projects. Wells with IP rates of 16,000 boe/d are precisely what types of wells are required to move the production needle for large cap E&Ps and super majors. Occidental put all their eggs into the Permian Basin basket and they are now the largest producer within the basin. 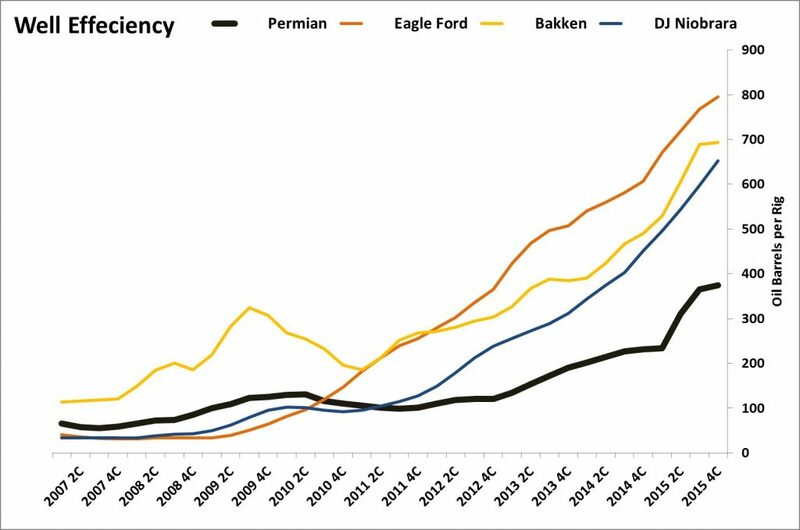 This has paid off tremendously as Permian operations have just begun to reach shale efficiencies of the more mature Eagle Ford and Bakken shale formations. Although the Permian is the largest producing formation of all US formations, it still has some room to improve. Over the past 5 years, horizontal drilling and hydraulic fracturing techniques have improved dramatically and has led to the development of multi-stack formations. 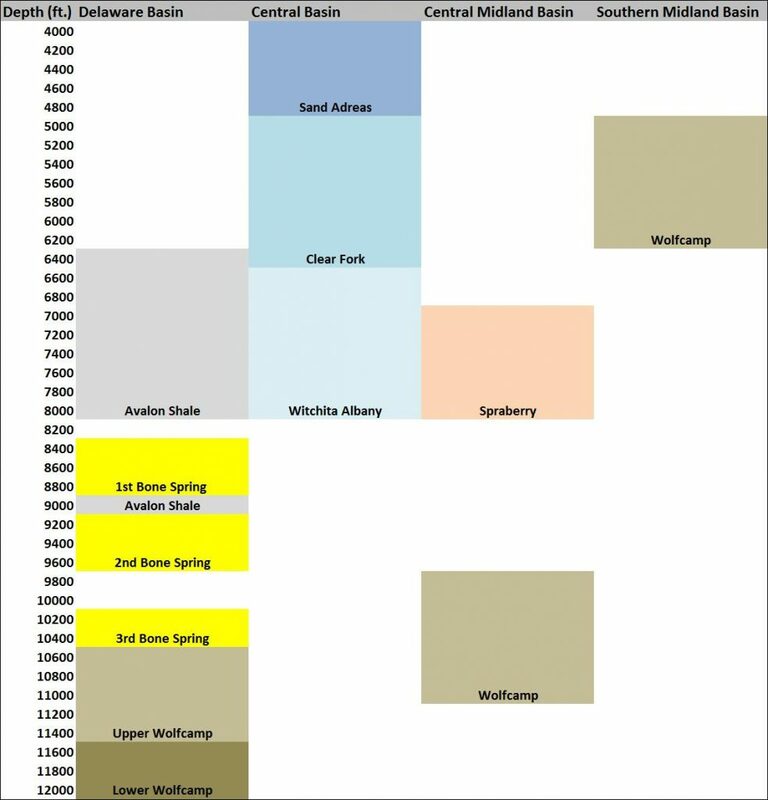 Below is a snapshot of the Permian’s layered formations. Importantly, one must think of acreage as 3-dimensional, not just surface area. Each sub layer represents oil and gas that can be unlocked and horizontal drilling and fracturing are what allow this to happen. 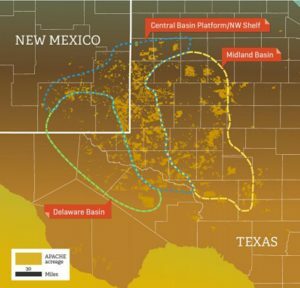 Occidental’s potential acquisition of Apache would give the new company ultimate control over the entire Permian Basin in terms of being the largest producer and the company with the most acreage. The Occidental-Apache entity would hold over 3 million acres and produce 21% of all Permian production. Occidental’s major concern of overexposure to US shale production is the 60-70% annual decline rates in horizontal shale drilling and fracturing. 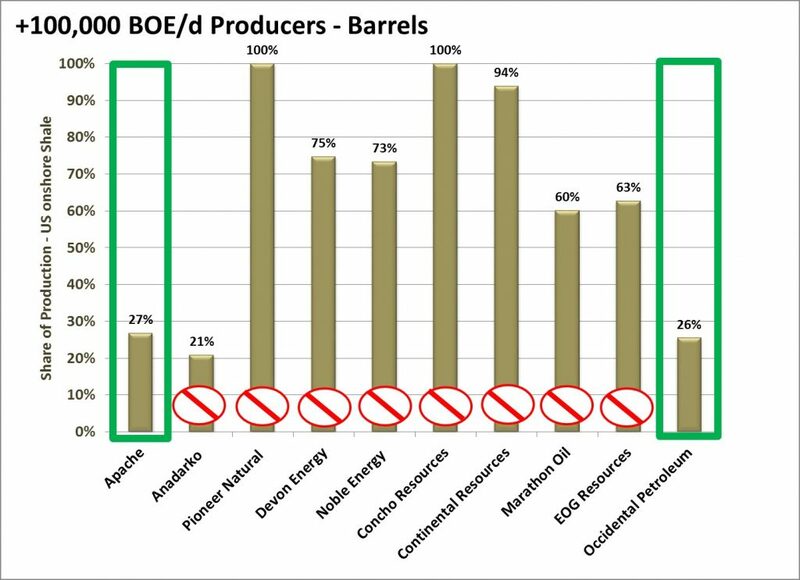 However, Apache is only 54% exposed to those decline rates from its total Permian shale production of 170,000 boe/d. 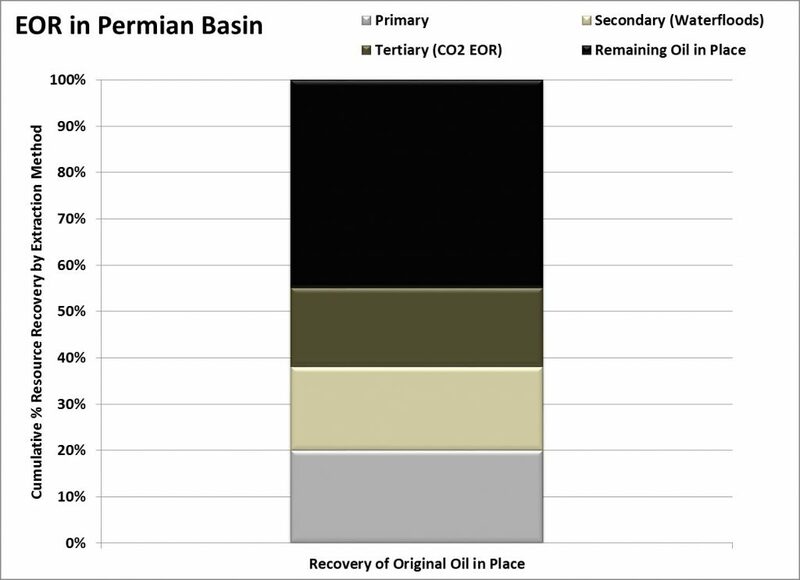 The remaining 46% of its Permian production comes from Apache’s Central Basin/NW Shelf operations with decline rates of 14% due to enhanced oil recovery water flooding and CO2 flooding. In both flooding methods the water and/or CO2 are sent into the formation through an injecting well. This re-pressurizes the formation and forces CO2 and water to mix with oil, which expands and moves up and out of a producing well. The lower decline rates help Apache manage their capital costs in bad times as they have the option of spending less than those higher declining shale wells in the deeper part of Midland and Delaware Basin. In an acquisition by OXY, the lower decline rates help limit Occidental’s US shale decline exposure to the targeted 20%-25%. 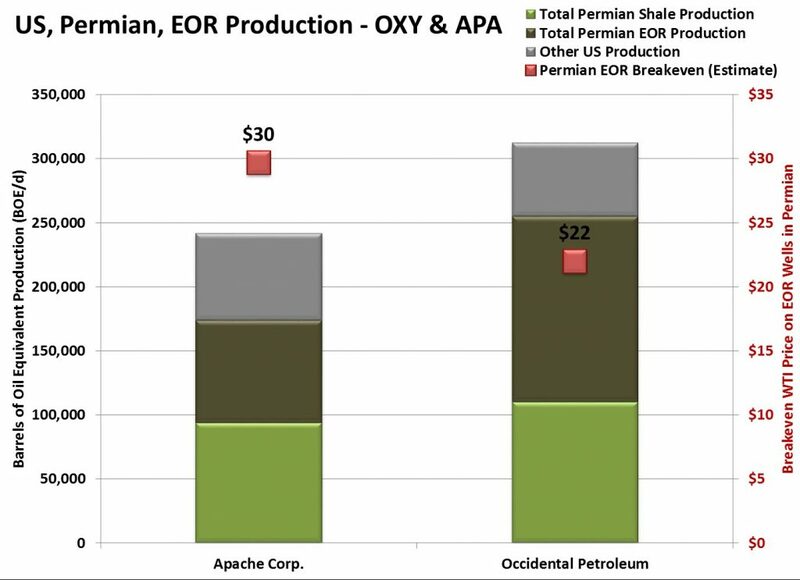 Apache’s mix of EOR and unconventional shale operations keep its onshore US production in the cheapest range possible. All North American onshore production can be sustained at a $45 oil price. Apache will spend the bear minimum onshore North America because of its ability to bring these wells on in a short period of time when prices improve. 1. Occidental Petroleum is already the largest independent oil producer in Oman with 75,000 bbls/d and 43 MMcf/d of net production. 2. 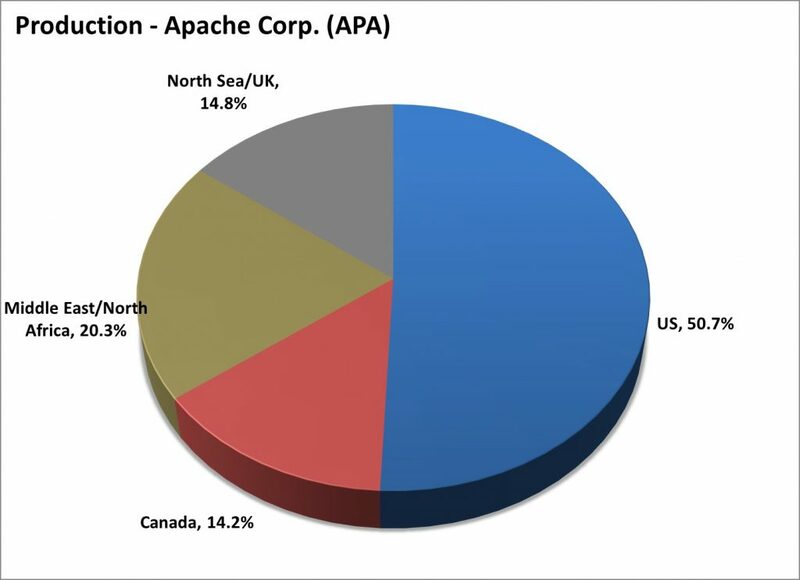 Apache is the second largest oil producer in the UK North Sea. The company has spent $2.6 billion in the North Sea to establish infrastructure. Now, Apache is in the process of leveraging that spending in a low price environment where UK operations break even at $35 oil. 3. Apache produces 20% of the oil in Egypt and holds exclusive rights to privately market its oil to the global market. The company has minimal infrastructure spending and Apache has taken on the role of innovator in Egypt. The company’s Western Desert assets hold similar layered formations to those in the Permian Basin. 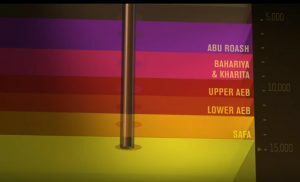 Apache has leveraged its knowledge to horizontally drill and fracture layers in Egypt that have tested at rates 10 times the amount of its Permian wells. Apache has now begun partnering with Shell to explore horizontal drilling on Shell’s concessions in Egypt. 4. Together Apache and Occidental will own 21% of the production of the Permian Basin: the largest basin in the US. Apache’s low decline and enhanced oil recovery techniques in the Central Basin compliment Occidental’s position – providing some cost saving and technology sharing – and provides Occidental with a US shale asset that can better whether a low oil price environment. Apache’s EOR operations in the Central Basin have wells that can payback its initial investment in less than one year at $45 oil prices. 5. Occidental’s potential acquisition of Apache would bring the entity’s total production up to 1.2 MMboe/d. This would categorize the company in another league of independent oil & gas producers. 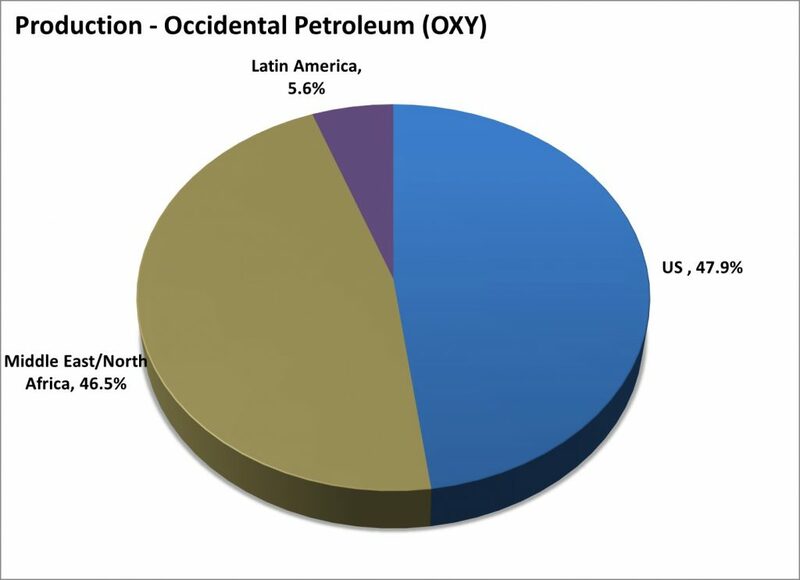 Occidental would now directly be compared to the likes of oil & gas majors: ConocoPhillips, Eni SPA, and CNOOC. The OXY-APA entity would have a high margin liquids content with the least amount of debt relative to its reserves. Occidental stands atop their peer group in their ability to flex their balance sheet and share price during the downtrend and capitalize on the arising opportunities. 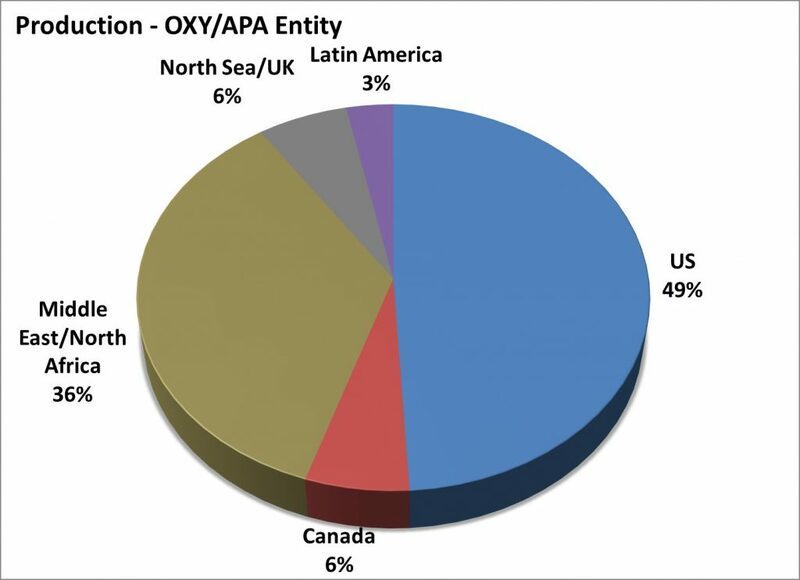 The new Apache-Occidental (APA-OXY) company would be very unique with profitable low cost operations in the Middle East, the North Sea, Latin America, and EOR operation onshore US. The company will also have the growth upside of a 3 million acre position in the US shale formation of the Permian Basin that can bring on production when prices increase above $45 per barrel. The company will generate 78% of its revenue from oil & gas operations and 22% from OXY’s chemicals and midstream projects. It is tough to pull the M&A trigger in market conditions like these, but I believe Occidental is best suited to capitalize on the opportunity at hand, setting themselves up as the next super major. ** All opinions and investment advice are those of the author and don’t represent Geopoliticalmonitor.com, which published this article.